Every one of us likes to stay and stay in a safe place, but there are some places in the world where there is a lot of danger for human life. In some of these hazardous places, people are still forbidden to go. At some places in these places there are such dangers, that if the situation changes even a little bit, then millions of people can go to the mouth of death. Some places are such that if a person goes there, the possibility of coming back to him is very rare. 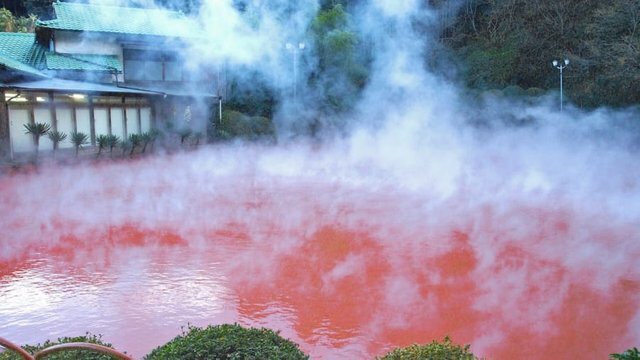 Today i will tell you about “Bloody Pond” which is one of the most dangerous place of earth. This is one of Japan’s most famous places. Swimming in this puddle is forbidden because its temperature remains 194 Fahrenheit. The water of this lake is red like blood. The reason for water being blood, is high amounts of iron and salt. Here the steam evaporates from the water surface. Looking away from this place, looking like a door to hell, it seems as if blood is boiling.